President Bianco (left) looks at ITER from both a global and local perspective. 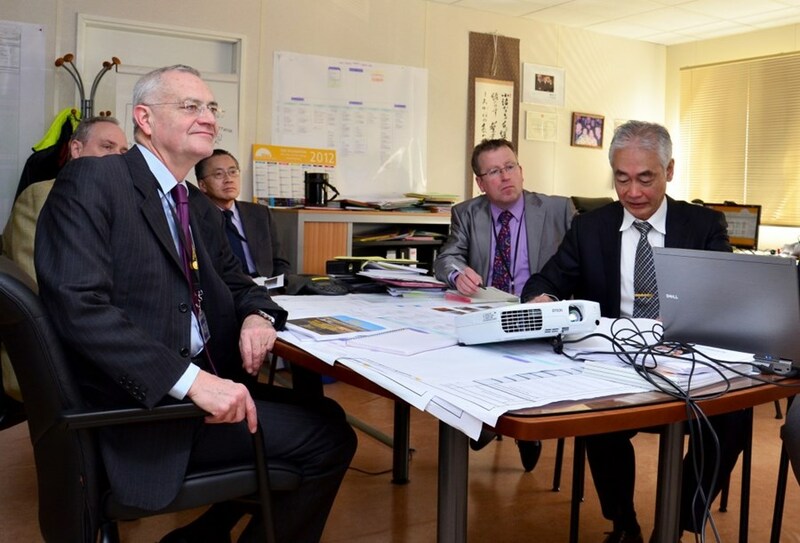 He is seen here in Director-General Motojima's office with Deputy Director-General Carlos Alejaldre, Head of ODG Takayuki Shirao and Head of Communication Michel Claessens. From the behaviour of the Sun's neutrinos to the benefits of the ITER project for the local economy ... conversation between Director-General Motojima and president of the Alpes-de-Haute-Provence département Jean-Louis Bianco, on Thursday 1 March, covered a broad scope of issues and prospects. A member of the French Parliament and département president since 1998, Mr Bianco was also Secretary General of the Presidency for nearly ten years (1982-1991) under President Mitterrand and, in that role, his closest advisor. His interest in ITER, which he expressed very strongly during his half-day visit here, stems from both a global and a local perspective. As a respected policy-maker, he is convinced of the importance of developing fusion energy for the benefit of future generations. As head of a vast but sparsely populated départment—largely dependent on tourism (40 percent of GDP)—he was particularly interested in the latest figures on the local economic impact of ITER that were presented by Agence Iter France director Jérôme Paméla. The Alpes-de-Haute-Provence département contributes EUR 10 million of the EUR 467 million that local governments allocate to the ITER project. As of 31 December 2011, EUR 29 million in industrial contracts from the ITER Organization, Agence Iter France and Fusion For Energy have already been awarded to companies based in Mr Bianco's département. For Mr Bianco, this story was as captivating as the one about the Sun's neutrinos.